See more objects with the tag clouds, communication, water, cranes, identity, status, birds, clothing, government. See more objects with the color rosybrown sienna darkslategrey slategrey sienna or see all the colors for this object. This is a Rank Badge (buzi). 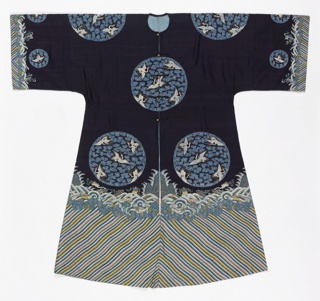 It is dated Ming dynasty 1368–1644 and we acquired it in 1902. 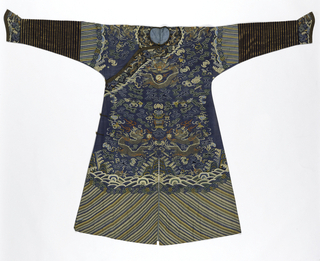 Its medium is silk, gilded paper and its technique is plain weave with discontinuous wefts (tapestry). It is a part of the Textiles department. This rare Ming dynasty rank badge would have been worn by a first rank civil official, woven into or appliquéd to a long, full-skirted red robe accompanied by a gem-inset hoop belt and black gauze winged hat. 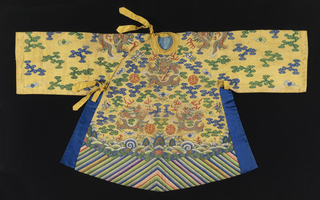 Square badges with birds or animals can be found in Yuan period (1271-1368) court clothing, but it was not until the Ming dress regulations of 1391 that animals and birds were systematically corresponded to civil and military ranks, and the term “rank badge” (bu zi) appeared. The rank badge system proved both enduring and influential. It continued through the Qing dynasty (1644-1911) and into the early Republic of China, and was adopted by neighboring vassal countries like Korea and Annam (central Vietnam). 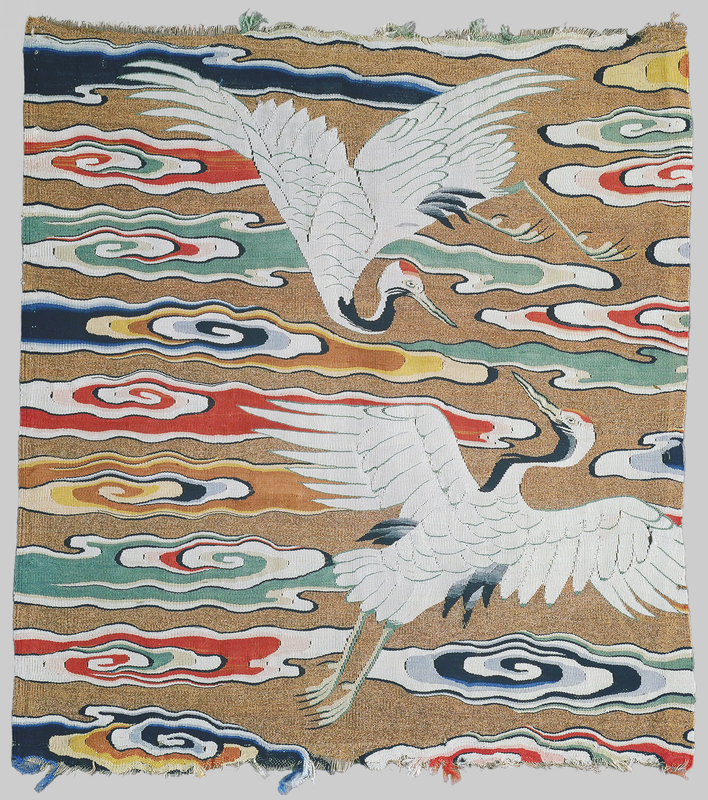 This elegant example shows a pair of white cranes circling each other in flight, set against the clouds rippling in broad bands of warm colors. In Chinese culture, the crane is a symbol of longevity, and is often seen in Daoist imagery transporting immortals to mystical islands. Flying cranes came to allude to a rise in rank, in this case indicating a first-rank official. 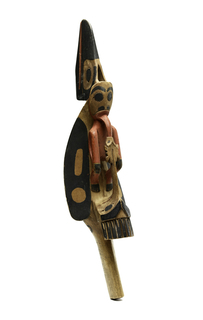 This object was featured in our Object of the Day series in a post titled Longevity . 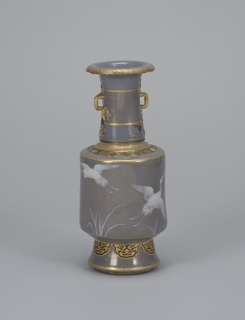 This object was donated by John Pierpont Morgan and catalogued by Miss Jean Elizabeth Mailey. It is credited Gift of John Pierpont Morgan.